Factory style Convertible Top with window section. This Top fits Late 92 & early 93 models, please click on diagram link below in Yellow box before ordering to determine your car top model. You can buy a Top with window as a complete outside cover, or you can just buy the Top only section or window only section as needed. This convertible top for the Pontiac Sunbird & Sunbird SE fits the Late 1992 and Early 1993 model years. Warranty Replacement info: All Tops & Plastic windows come with 6-year warranty. All Glass windows in addition to 6-year warranty also includes Lifetime Glass Window Bond warranty to the original purchaser. Warranty Labor info: EZ ON brand includes (18) months labor allowance from purchase date. Topsonline brand includes NO labor allowance (replacement only). You can read detailed warranty information on our warranty page. We offer EZ ON brand as premium quality Convertible Top, we offer Topsonline brand as Economy Top (less expensive alternative). EZ ON brand is used by professionals and is known for quality workmanship & precision tailored craftsmanship. If you buy Top with Window, you will receive both the Top & Window sections (complete outside cover) ready for installation. No sewing required just installation, each section installs on the Top frame separately same as factory Top. 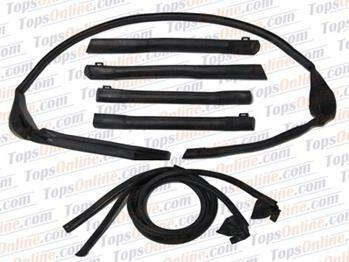 This Pontiac Sunbird Convertible Top product includes a Pontiac Sunbird installation guide. It will either be included with your product when shipped or it will be sent via email after your order has been shipped if requested. We offer Factory style replacement Convertible Top Cover section only & Factory Style Replacement Rear Window section only. Top covers & Plastic windows come with 6-year warranty. Rear Glass Windows come with 6-year warranty & Lifetime Glass Window Bond warranty to the original purchaser. If you buy Top cover only, you will only receive the front section of the Convertible ready for installation (no sewing required). You will not receive any materials related to the window section, your existing window section has to stay on the car. If you buy Glass Window only or Plastic Window only, you will receive a new window laminated to a new material known as window curtain ready for installation (no sewing required). Made with original Nylon webbing material, sold as a set, buy one set per car. You can re-use your existing Top Pads if they are in good shape. This Top has 2 sets of Cables, Side Tension Cables located above the front side windows & Rear Quarter Flap Cables located above rear side windows, please choose accordingly. Cables sold as a pair, buy one order of each per car. You can re-use your existing Top Cables if they are in a good shape. High quality replacement weather seals very smooth skin that is free of exposed cells or flaws. Guaranteed for a full 5 years. Made with special Black Well Liner Vinyl material to match the interior (backing) of the Top. You can keep your existing Well Liner if it is in good shape. Made with hard plastic, sold in 6 feet cuts. Tacking strip can be easily cut, grinned or stacked as needed. Rear style tacking strip size is 3/8 x 1/2 inches. Front style tacking strip size is 1/8 x 5/8 inches.